In St. Petersburg's State Hermitage Museum, it's easy to drift into a dreamscape, to be overtaken by this mysterious palace of bygone eras, once home to Catherine the Great, Alexander I and Russia's last Tsar, Nicholas II. Founded by Catherine in 1764 and first made public in 1852, this imperial museum is a singular expression of baroque architecture and design, a gilded showcase of nearly incomprehensible wealth, beauty and artistic achievement. The Hermitage comprises 365 rooms and some 3 million objects, a collection so vast that it would require more than five years to spend a minute with each piece and a journey of nearly 14 miles to traverse every room. One could understand if the Hermitage was solely focused on restoring what was and maintaining what is. Yet since the early 1990's, just after the collapse of the Soviet Union, the Hermitage has begun a visible process of reinventing itself, expanding its identity to make itself contemporary and relevant—indeed, to enable it to survive. 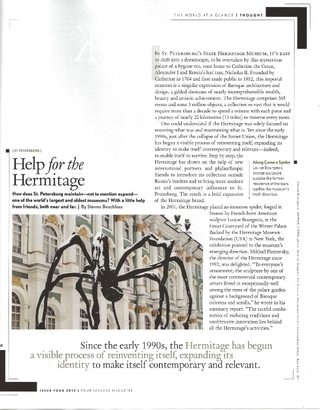 Step by step, the Hermitage has drawn on the help of new international partners and philanthropic friends to introduce its collection outside Russia's borders and bring more modern art and influences to St. Petersburg. The result is a bold expansion of the Hermitage brand. 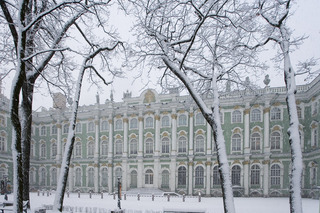 Read the full story of St. Petersburg's Hermitage Museum here.